Some of those who know my blog might know the title of this post, at least its first part. Most things to know about surviving a capoeira angola roda were already posted in one of my first posts. Today’s post is about a certain aspect of a Capoeira Angola game. But this aspect is also something many people have to get used to. I hope this post will help in that process. 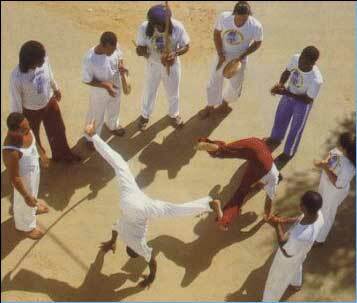 According to Mestre Moraes the aim of the Game of Capoeira Angola is movement itself. That is, maximizing your own and minimizing your opponents possibilities to move. One might say now “wait, that’s not the only purpose” and yes, that’s right. But, and that’s why I write about this topic, it comes up every now and then. With this post I will give you some hints, what to look for when you are in a Capoeira Angola Roda, but most importantly this information is for you so you dont panic when you feel cornered. Because, if you know what’s going on, you can start thinking about the way how to get out. And not panicking is a good step further on the way to a better game, no? Ok, so now the big news, a Roda is a circle. At least almost a circle. On one side of the circle there is the Bateria. And the rest of the circle consists of people. The people observe your game, give energy by singing along and do define the boundaries of your game. These boundaries shouldnt be crossed. Entrance to the Roda is defined by the edges of the bateria. And entrance into the game is defined by the spot in front of the Gunga. So far most of these things are things you people already know. Some people who already have seen a Roda de Capoeira Angola will also be able to tell that in a Capoeira Angola Roda people are sitting or crouching in the circle. This helps keeping the circle tight and at one position. More important is that Capoeira Angola circles are usually smaller than circles of Capoeira Regional and Contemporeana. A diameter of about 2 meters or 1.50m (sometimes also only 1 meter) is a good size for a capoeia angola roda. The advantage of this size is that there is actually no space to keep out of reach. One step forward and you are close enough for an attack however the positions where before. This forces both players to play and react properly (on the otherside, usually you also have more time to do so, because too fast games are not liked much in capoeira angola). The knowledge about the dimensions of the Roda you are in is important. Also the knowledge that it’s a circle. 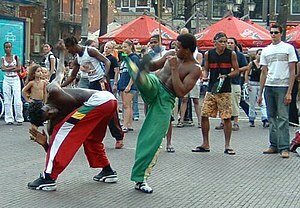 Capoeira has a lot to do with moving around. The Ginga and the Au are the first things you learn in Capoeira. And that is for a reason. There is only few things more boring than a game between two players who stay at their positions. It then resembles one of those 90’s computer games like “Mortal Combat” or “Street Fighter”, where player A is right and player B left. All the round kicks and turns and other movements of Capoeira do make less sense when you only have one direction to take care of (your front). So the first thing to know about the “Space Game” in Capoeira (Angola) is: you are mobile. As simple as it seems, some people panic and freeze at the spot. Although it might not be bad to stay at a spot sometimes, it definitely makes their game less fluent and thus, less attractive. The Roda being a circle does want you to move around each other. 1. You can move in any direction, left, right, forward (to your partner) and backwards (away from your partner). 2. Your partner/opponent has less opportunities, because behind him there is the edge of the roda. So moving backwards is less of an option. 3. when you stay in the center most of the movements of your opponent will be left or right, which leads to him travelling around you. He is making more meters in the game than you are (because in the center you only have to turn around), which can, in a longer game, be extremely tiring. On the other side it’s good to know that it’s not a shame to be on the edge. Yes, when you were forced to the edge it’s a sign that the other person did dominate you, but in Capoeira you get dominated once and the next day you dominate, and the other day nothing happens. As long as you dont panic on the edge the game is not lost. And the better you are the more opportunitues you will find to get away – or to gain dominance over the center. Cornering is a step further than just forcing somebody to stay on the edge of the Roda. Cornering is the art keep the other player close to the edge and to hinder him from moving sideways too, until he a) finds a way out, b) submits by standing still until you let him go or c) does make such a mistake that he could get a Rasteira, Cabecada or some other “finishing movement”. It’s not the nicest way to play with your partner (and some people might get annoyed or agressive because of such a game), because it is almost equivalent to a Rasteira. You stop the possibilities of your partner to move. On the other side, a Rasteira is usually much more spectacular than plain cornering, which is the reason why some people disregard cornering as bullying and playing unfair. 1. Cornering by size: the bigger you make yourself the harder it gets for the other to get out. When your partner is on the edge and on the ground, standing up is an option (and a danger too, cause a Rasteira or Tesoura might end your attempt). You can also move and place your legs in the possible directions your partner might take, thus hindering him from his escape. 2. Cornering by speed/experience: When you are faster than your opponent you can just move into every direction he just wanted to move. This is not so easy, cause at a certain speed you will not be able to distinguish a feint from a real attempt to escape. And when you speed up your partner will speed up too. 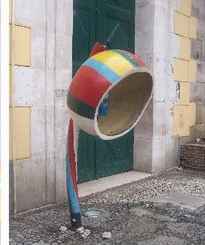 This will eventually spiral up to a speed where you will hear the Berimbau calling you cause you have been too fast. Experience helps more in this terms. This includes the ability to read the other player. When you know what he is gonna do then you dont have to be fast to be able to block that movement. 3. Cornering by psychology (or Mandinga): The best way to corner a person is making that person believe there is no way out. Either you scare that person by a sudden change in speed level or you distract him by a certain smile. Or you just look into a certain spot in a way that he thinks you gonna go there. Or you just dont look at him anymore (keeping an eye on him on the edge of your sight) which makes him nervous or at least ignorant about your motivation. These are only a few possibilities I can think of. And I guess that there are thousand others. A good player does not only know how to corner somebody, but also how to get out of that. The ways to get out of there in a nice way are easily described, but all of them do need one premise: no panic. If you dont panic, and this accounts for the whole game, you cant do much wrong. Because if you panic, you will react instinctively, which can be wrong. Some of those reactions are letting yourself fall, run out of the roda, starting to grap the opponent, knocking him out, run against your partner, and stuff like that. All of them are ways do get you out, but with that you are killing the game. So which are the ways to get out of there? 1. Escaping by refusing: You can stop moving. OK, this is actually submitting yourself and giving up, accepting that the other person did corner you and that you are not able or willing to get out. At a certain point, your opponent will have to release you (otherwise the game will have to end). It’s not the best way to get out, but it’s far better than using brute force – or falling out of the Roda. 2. Escaping by fighting back: There are several movements which can help you get out of the corner. All of these are attacks which make your opponent back up or move another way. Those movements dont work always and with every opponent, but using them is often very secure and leaves you with more space at the end than before. These movements are: Tesoura, Cabecada and Chapa de Costas (amongst some other). All of these are simple movements, and that makes them so effective. On the other side, there is always the possibility to get a counter-attack, so dont think that they are optimum solutions. 3. Escaping by Blocking: A major part of cornering is hindering a person to go this way or that way. But this game can be played by both. This will eventually lead to a Remis situation, which wouldnt improve the dynamics of the game but would definitely improve your own situation. 4. Escaping by intelligence: finally, the best way to escape is also exactly the best way how to corner a person. By anticipating, by experience, by wit, by Malicia and Mandinga. If you are experienced and dominant enough you can make the opponent think you will definitely go there. Thus, if he tries to block that possibility he has to open up other possibilities. Finally, you have to realize that this is only part of the game. It’s important and some of these hints are both smart in Capoeira Angola and Regional/Contemporeana. And, I know I repeat myself here, dont panic! I realized the other day that I did write mostly about serious topics. That is ok, cause, well, Capoeira Angola is something I take serious. But as important as all the cultural aspects and the little rules and the philosophy of capoeira is the fact that Capoeira Angola is FUN!!! I sadly dont have any real footage showing me playing (if I do I’ll promise to post it! ), so I decided to post my favourite Capoeira Angola youtube videos this time. I will also say one or two things about them, although, most of the time the videos are talking for themselves. The first video does show a footage I have already in my history page in this blog. 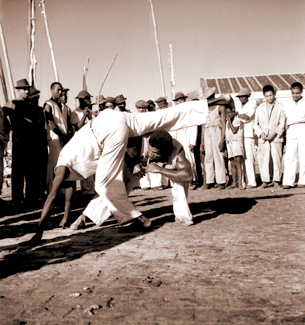 It shows the two Grand Mestres of Capoeira Angola, Mestre Joao Grande and Mestre Joao Pequeno, playing. As these guys do not get younger but are still alive and kickin’ and it is just a great atmosphere to see 160 years of Capoeira Angola in one circle the second video is also one of my favorite ones. There is a lot more and many other videos from mestres I admire. One of them is Mestre Cobra Mansa (of course!) and so I want to put one of my absolute favourite videos in here, too. He is playing Mestre Ponchianinho here, from Cordao de Ouró. It is also one of the proof videos that Capoeira Angola does have a rough game, too. But on the other side, there are also very beautiful games which do not show (much) antagonism. The next video is a premium example for this. It shows two students of Mestre Jogo de Dentro and there almost perfect interplay in the roda. Some other Mestre who is just plain very interesting in his style is Mestre Camaleao, who seems to have a huge amount of moves I’d never dare to use in a roda (out of fear that my opponent would kill me afterwards!). He is also a rough player, at least in this video. Although it is the third time that I have Cobra Mansa in my video collection this video is not about him but about a 10 year old boy who is definitely somebody I should keep in eye! Check him out! And last but not least a bit of a musical final. A guy getting interesting sounds out of the Berimbau! I hope you enjoyed this little collection of Capoeira videos. And my message for this post is quite simple. Never, never forget that Capoeira and Capoeira Angola is for joy! I would also like to see what YOU people like. Which youtube videos can you recommend?